This could be a great help understanding Mars' structure. It wasn't long ago that we heard about scientists finding water on Mars' surface. Well, now the time has changed and we now have the actual pictures that suggest the possibility of water there might be true. The European Space Agency (ESA) has released a few images that were captured by its Mars Express probe. The images show a giant crater called 'Korolev' on the surface of the Red Planet. The newly found crater has been named after chief rocket engineer and spacecraft designer Sergei Korolev, who is known for his contribution in building the Soviet space technology. The crater was found in the northern lowlands of Mars. 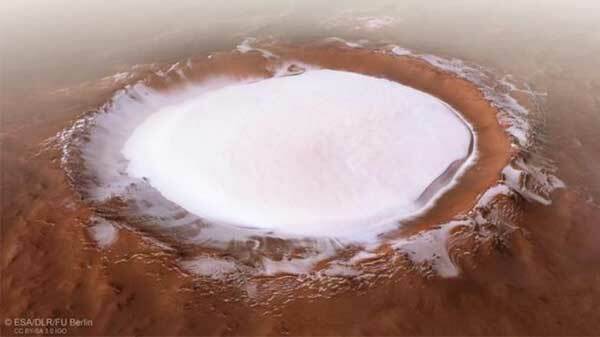 It is close to 82km wide and it encircles part of Mars' northern polar cap. It is said to be approximately 2km vertically deep. The ESA said that Korolev is a well-preserved specimen of craters on the Red Planet, and is filled with ice and not by snow. It is filled with ice due to a phenomenon called a 'cold trap' caused due to the floor of the crater which is two kilometers beneath the rim. The deepest part of the crater with ice act as a natural cold trap. The air that is moving over the deposit cools down and makes a layer of cold air that's always there above the ice. The layer ensures that the ice remains stable and doesn't let it heat up and disappear. Since air isn't a good heat conductor, it results in keeping the crater icy forever.